I have done a series of homemade dressings and have included a tab above, suzyhomemaker sauces, where you can find all of them listed with links. Today I am guest posting for Adrianne over at Happy Hour Projects. 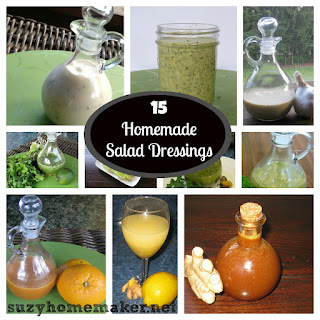 She has had a busy month and asked me to share a post on one of my homemade dressings. I chose my homemade blue cheese dressing. It is a really simple dressing and most of the ingredients are basics that you should already have on hand. And check out all my homemade dressings.